I have been reading a lot about the benefits of Vitamin C serum and the show Dr.Oz had with 2 dermatologists convinced me that Vitamin C was worth giving it a try. Like most people, I am budget-conscious and am a very hand-on person, DIY is the only way to go. L Ascorbic Acid is a powerful antioxidant that helps heal and protect skin from photo damage. It helps to inhibit the free radicals which cause sun spots, discoloration, fine lines, wrinkles and other similar signs of aging. It also increases collagen production. As we age, collagen production reduces, which results in sagging skin. What else can one ask for? Besides, Vitamin C powder is very inexpensive and lasts over a couple of years at least, stored in a cool and dry place. 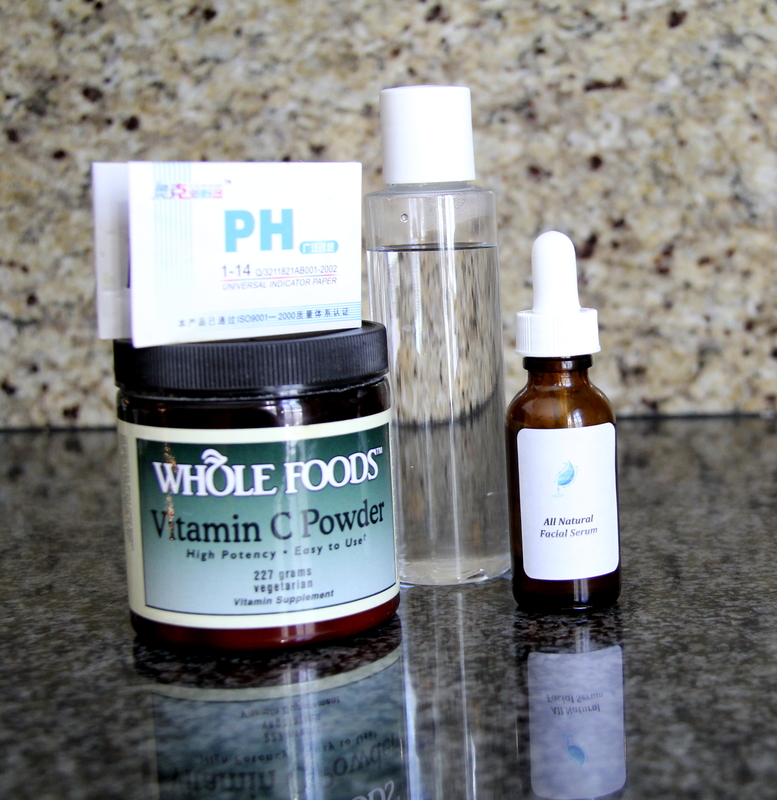 After having done lots of researches, read almost every single post out there about DIY vitamin C serum, and trials and errors, ( I have sensitive skin), the following recipe finally delivers the results I have been looking for: dark spots fading, glowy skin, wrinkles reduction especially around eye areas, and collagen boost. The results are easy to see except collagen. You may wonder how I know that the collagen did indeed increase. When I pinch my face, it feels tight and plump. And I didn’t have that before. Vitamin C oxides quickly when exposed to water, air and light. By making a new batch every time, you ensure that the Vitamin C you put on your face is the most potent! And there is no worry about the oxidation. Once it oxides, it does damages to the skin! If you have never used Vitamin C serum, start with 5% and see how your skin tolerates. You can then increase the percentage on a weekly basis. Vitamin C serum needs to be at PH level 3-4 to be absorbed properly. Use a PH test strip is a good idea at least at the beginning to test the PH level of your homemade serum. You can make it once a week to ensure potency and freshness and store the serum in an amber glass bottle with glass dropper (as shown in the picture) in the refrigerator. Do not use plastic or metal. Vitamin C may cause some chemicals in the plastic to leach into the serum. Metal interacts with acids. Here is the ration of Vitamin C to distilled water. Every night, I put a few drops of Vitamin C serum in the center of my palm, and then add 1-2 drops of my homemade facial serum to the Vitamin C serum. Mix in two products gently with your finger and apply a thin layer to your face, neck and décolletage. Don’t forget about your hands! I avoid putting the serum on the nose because it gave me blackheads! If too much serum is applied, it won’t be properly absorbed into the skin, which may result in excessive serum oxide on your skin! 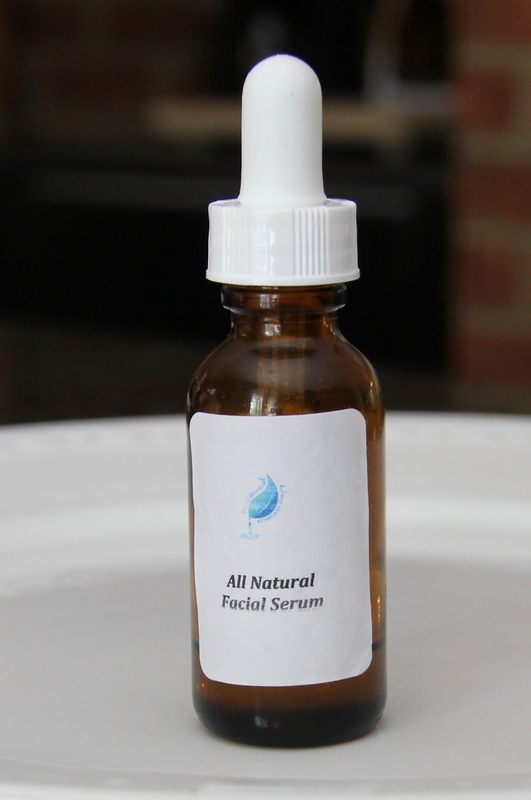 The facial serum I make include the following skin beneficial carrier oils: apricot kernel (great for sensitive skin), jojoba oil, rosehip oil, avocado oil, tamanu oil, baobab oil, carrot oil and Vitamin E. Being a certified aromatherapist, I can’t resist adding a few 100% essential oils. Why add carrier oils to the Vitamin C serum? There are two reasons why I do this. First I have sensitive skin, straight Vitamin C serum is too harsh for my skin. Oils provide buffer effect and moisturizing quality. Secondly, lipids help Vitamin C serum penetrate skin more effectively. After the Vitamin C serum dries and is absorbed into the skin, which takes about 15-20 minutes, you can layer it with other products. I have an etsy shop. Convo me if you are interested in purchasing the facial serum. I make fresh batch when you place an order. You can always customize the order. Thanks for reading! And I hope you are able to pick up a tip or two to customize your own DIY. The packaging will have both Vitamin C and L-Ascorbic Acid. L-Ascorbic Acid is a natural form of Vitamin C.
Peppermint is better reserved for sore muscles and stomach issues. Rosemary is an excellent choice for skin care. However, you want to make sure is the chemotype: verbenone which is skin nourishing. Very interested in this item. I can’t find you on Etsy.com Are you selling on the Canadian site?. could you post a link. here and in your site. just starting blogging 101 myself! It is http://www.etsy.com/shops/puressential. I haven’t got a chance to list the serum yet :_(. I tend to procrastinate. Welcome to blogging 101. I am new to blogging too.